This book was a bit of a runaway hit in my reading circles this year and when I picked it up I hadn't even read the description yet. As a weird bonus for me, it takes place around where I went to high school, where I was struggling with feeling like the only queer kid in my class. 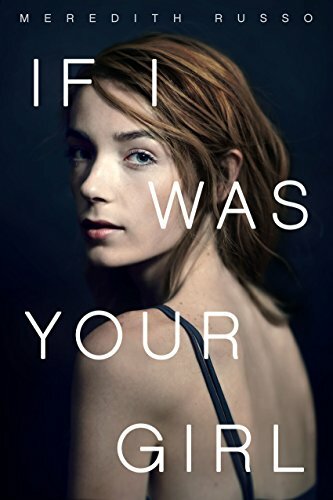 If I Was Your Girl is about Amanda, a teenaged trans girl who moves in with her estranged father to escape bullying and assault, and to start over after a suicide attempt and then transitioning. The story jumps back and forth between a few different time lines, slowly revealing the corners of Amanda's life. Amanda begins school, unsure of what to expect. She's happy that she quickly gets adopted by a group of girls: an arty queer girl, a Born Again Baptist with a party side, a fashionista, and a secretly bisexual girl. At lunch, a boy approaches her on behalf of his friend asking for her number, which begins a sweet, nerdy romantic relationship. I thought about how every person could hold two truths inside of them, how impossible it felt sometimes to have your insides and outsides aligned. Through the regular torture that is high school, Amanda finds herself truly happy for the first time in her life. Her relationship with her new boyfriend is going well, but she's having anxiety feeling like she needs to disclose her past to him. Her father is always in the background - a little overprotective and trying to come to terms with his own ignorance on behalf of his daughter. As always, Amanda's mom and Virginia, her trans mentor, are there for her, even far away in Atlanta. If I Was Your Girl is marked as a YA novel, but honestly it's written so sweetly that it'd be perfect for anyone at a middle-grade reading level or higher. I couldn't put it down and was bawling happy tears mid-way through. There are a few tropes used, but the author is a trans woman herself, so I trust her judgement.